Decorate pirate room with pirate bedding, pirate growth chart wall decal, pirate table and chairs, pirate wall decor, pirate beds and map. 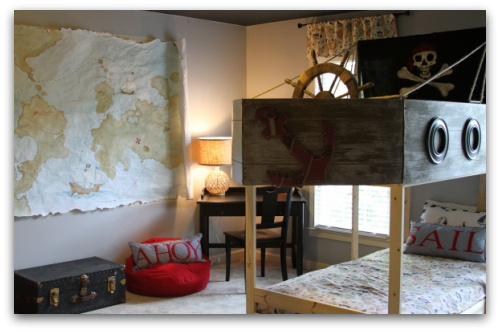 Create an original pirate theme bedroom for your child that will make his friends envious! The look isn't even that difficult to achieve. Hang a pirate map, or a map that is antiqued to look old and worn, on the wall. Find old trunks at consignment stores or even army surplus stores to store your child's toys and books. Turn a simple wood bed frame into a pirate bed by adding pirate bedding and securing old helm, or steering wheel, to the bed and wrapping a pirate flag around the headboard. 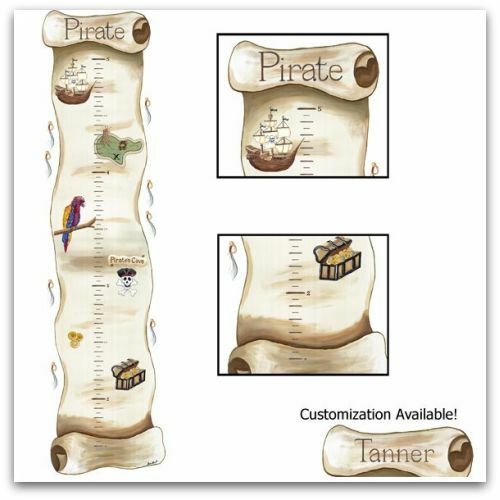 Use a pirate scroll wall chart to mark your child's growth as well as add to the pirate decor in the room. The scrolls are customizable and will be keepsakes that help you remember your child's early years. 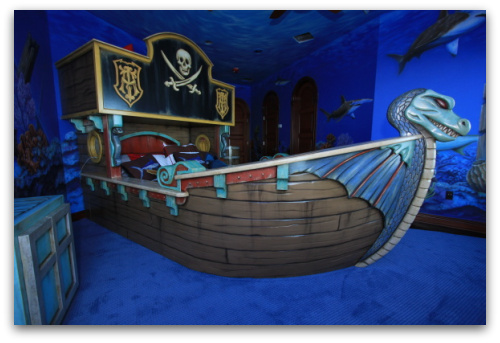 For more advanced pirate theme bedrooms, turn an ordinary bed into a pirate ship by surrounding it with wood formed into the shape of a boat's bow. Get as decorative as you want if you are a handy carpenter, or purchase a pre-made pirate bed online. Paint the walls of the room blue and add fish stencil as if the boat has sunk to the bottom of the ocean, or paint the ocean on the bottom half and a horizon on the top half of the wall to look as if you are sailing. Add pirate bedding to complete the bed. 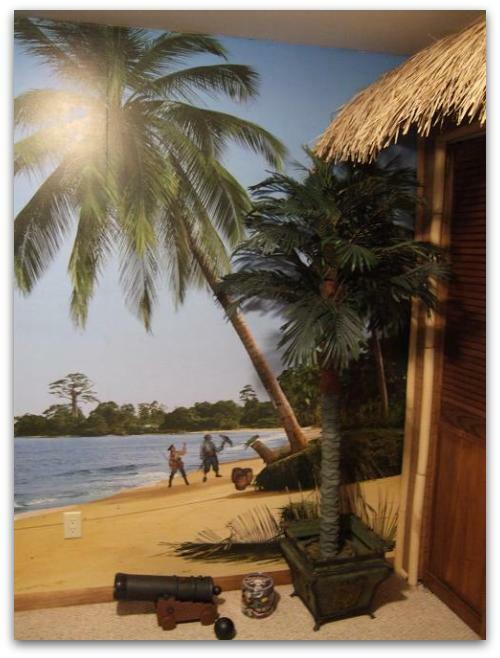 When pirates land ashore, they often find palm trees, tikihuts and valuables (or at least that's what they hope to find!). 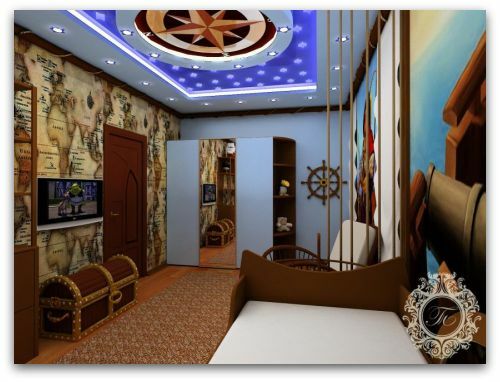 Create a beach scene for the room, leaving the bed as a pirate ship. Paint the room to look like sand on the bottom half and sky on the top. Place fake palm trees or fronds, depending on the size of the room, in the corners. Add a tiki hut to act as a closet or just turn existing closet doors into tiki hut doors by giving them a dark wood finish and adding some straw roofing on top of a decorative eave. 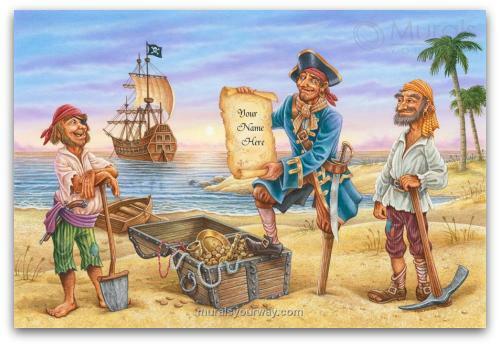 Add pirate theme letters to the room or hang them on the bedroom door so everyone knows whose room it is. Some children might even like a scull and crossbones to warn people to keep out! 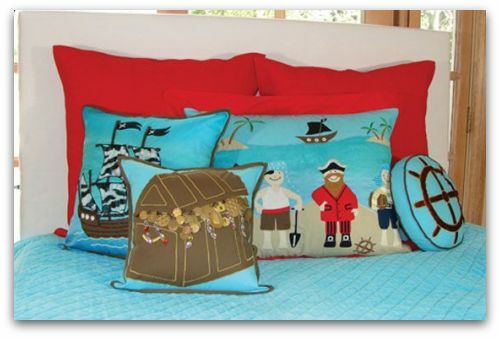 Pirate bedding is unique and clever; it's a look that you won't see many other places. Kids love to look at it, and it can even make bedtime more enticing! How you paint the room is very important; add navigational signs and instruments, helms (steering wheels), maps and blue colors to represent water. 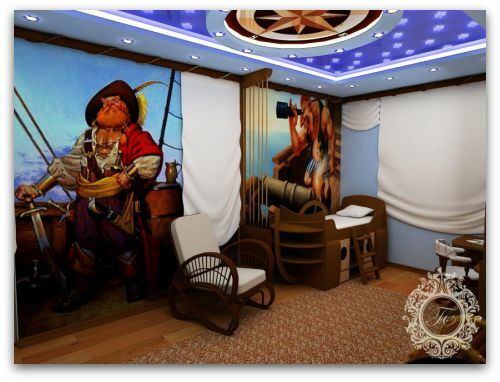 Remember to add the antiqued trunks and pirate bedding to complete the perfect pirate theme bedroom!